Presenting further studies in the prevention and treatment of coronary artery disease, this book brings together the knowledge accrued in the past decade concerning the role of immunity in the initiation and perpetuation of atherosclerosis. A strong group of international contributors summarize the diverse aspects of the interrelationship between the immune system and atherosclerosis. Preface. List of Contributors. Introduction: Autoimmunity as an Additional 'Risk Factor' for Atherosclerosis (Y. Shoenfeld, D. Harats, G. Wick). I Autoimmunity and Atherosclerosis The Autoimmune Pathogenesis of Atherosclerosis - an Evolutionary-Darwinian Concept (G. Wick, G. Millonig, Qingbo Xu). Autoimmune Aspects of Atherosclerosis (G.K. Hansson, A. Nicoletti). II Pathogenetic Immune Mechanism of Atherosclerosis The Role of Macrophage Scavenger Receptors in Atherogenesis (K. Takahashi, M. Takeya, N. Sakashita, M. Yoshimatsu, K. Jinnouchi). CD36, the Macrophage Class B Scavenger Receptor: Regulation and Role in Atherosclerosis (A.C. Nicholson, Jihong Han, M. Febbraio, S.F.A. Pearce, A.M. Gotto Jr., D. Hajjar). Atherosclerosis, Matrix-Metalloproteinases (MMPs) and Ischemia/Hypoxia (N. Lahat, S. Shapiro). Ceramide Pathway and Apoptosis in Autoimmunity and Atherosclerosis (T. Goldkorn, J. George, S.N. Lavrentiadou, T. Ravid, A. Tsaba, Y. Shoenfeld, D. Harats). &agr;-Defensins: Potential Link between Inflammation, Thrombosis and Atherosclerosis (A.A. Higazi, D.B. Cines, K. Bdeir). Lipids and Immunity (S.M. Watkins, J.B. German, Y. Shoenfeld, M.E. Gershwin). III Infections, Immunity and Atherosclerosis Immune Activation Augments Infection-Dependent Atherogenesis (G. Ricevuti, C.J. Wiedermann). Host Response Differences to Infection May Affect Disease Susceptibility in Atherosclerotic Patients (Jianhui Zhu, Yi Fu Zhou, S.E. Epstein). The Role of Chronic Infection in Atherosclerosis (S. Gupta, A. Sethi). IV Atherosclerosis Related Autoantibodies Atherosclerosis: Evidence for the Role of Autoimmunity (Y. Shoenfeld, J. George, Y. Sherer, D. Harats). Oxidized Autoantigens in Atherosclerosis (E. Matsuura, K. Kobayashi, J. Kasahara, Y. Shoenfeld, T. Koike). Autoantibodies against Oxidized Palmitoyl Arachidonoyl Phosphocholine in Atherosclerosis (Ruihua Wu). Autoantibodies to Endothelial Cells and Oxidized LDL in Human Atherosclerosis and Hypertension (J. Frostegard). Technical and Clinical Aspects about Autoantibody Assays for Oxidized Low Density Lipoprotein (O. Närvänen, A. Erkkilä, S. Ylä-Herttuala). Is There a Role for Paraoxonase in Atherosclerosis and in Antiphospholipid Syndrome? (M. Lambert, P-Y Hatron, U. Michon-Pasturel, E. Hachulla, B. Devulder, J.-C. Fruchart, P. Duriez). Anti-Prothrombin Antibodies in Thrombosis and Atherosclerosis (Y. Sherer, M. Blank, O. Vaarala, A. Shaish, Y. Shoenfeld, D. Harats). Detection of Cellular Activity in Atherosclerosis by the Novel Cellscan System (N. Zurgil, Y. Levy, B. Gilburd, E. Trubiankov, M. Deutsch, Y. Shafran, Y. Shoenfeld). V Anti-Endothelial Cell Antibodies (AECA) and Atherosclerosis (Section Editors: P. Youinou, P-L. Meroni). Pathogenicity of Antiendothelial Cell Autoantibodies (A. Bordron, R. Révélen, M. Dueymes, P. Youinou). Functional Heterogeneity of Pathogenic Anti-Endothelial Cell Antibodies (P-L. Meroni, E. Raschi, C. Testoni, M. Riboni, S. Praprotnik, Y. Shoenfeld). The Aspect of Anti-Proteinase 3 Antibodies as AECA (W-J. Mayet, A. Schwarting). Anti-Endothelial Cell Antibodies (AECA) in Systemic Lupus Erythematosus: Clinical Relevance (N. Sepp, G. Obermoser). Endothelial Cell Dysfunction in Atherosclerosis and Autoimmunity (G.S. Marder, H.M. Belmont). Modulation of Endothelial Cell Function by Normal Polyspecific Human Immunoglobulins (IVIg) (J-P. Duong Van Huyen, J. Chevalier, M.D. Kazatchkine, S. Kaveri). VI Accelerated Atherosclerosis in Disease Cardiovascular Morbidity in the Hopkins Lupus Cohort (M. Petri). Atherosclerosis in Systemic Lupus Erythematosus: Clinical Relevance (S. Jiménez, M. Ramos-Casals, R. Cervera, J. Font, M. Ingelmo). SLE as a Model of Autoimmune Atherosclerosis (O. Vaarala). Oxidant Stress in SLE Patients: Relationship to Atherosclerosis (F. Violi, F. Micheletta, L. Iuliano). Antiphospholipid Syndrome and Atherosclerosis (O. Amengual, T. Atsumi, M.A. Khamashta, G.R.V. Hughes). "Endotheliology" in Antiphospholipid Antibodies (T. Atsumi, O. Amengual, M.A. Khamashta). Accelerated Atherosclerosis in the Aortic Arch and Cerebral Ischemia in a Patient with Primary Antiphospholipid Syndrome (V. Pengo, A. Zocche, R. Scognamiglio, A. Biasiolo, T. Del Ros, A. Ruffatti). Rheumatoid Arthritis, Vasculitis, and Arteriosclerosis (P.A. Bacon, G.D. Kitas). Vasculitis of the Coronary Arteries and Atherosclerosis: Random Coincidence or Causative Relationship? (V. Štvrtinová, L. Rauová, A. Tuchyñivá, J. Rovenský). Dyslipoproteinemia and Premature Atherosclerosis in the Pediatric Rheumatic Diseases (D. Milojevic, N.T. Ilowite). Atherosclerosis and Familial Mediterranean Fever (P. Langevitz, A. Livneh, L. Neumann, J. Shemer, D. Buskila, M. Pras). Prof. Yehuda Shoenfeld is the founder and head of the Zabludowicz Center for Autoimmune Diseases, at the Sheba Medical Center which is affiliated to the Sackler Faculty of Medicine in Tel-Aviv University, in Israel. Dr. Shoenfeld is the Incumbent of the Laura Schwarz-Kipp Chair for Research of Autoimmune Diseases at the Tel-Aviv University. His clinical and scientific works focus on autoimmune and rheumatic diseases, and he has published more than 1750 papers in journals such as New Eng J Med, Nature, Lancet, Proc Nat Acad Scie, J Clin Invest, J Immunol, Blood, FASEB, J Exp Med, Circulation, Cancer and others. His articles have had over 35,000 citations. 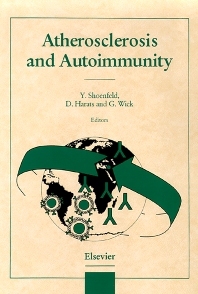 He has written more than three hundred and fifty chapters in books, and has authored and edited 25 books, some of which became cornerstones in science and clinical practice, such as "The Mosaic of Autoimmunity", "Infections and Autoimmunity" and the textbook "Autoantibodies" and "Diagnostic criteria of autoimmune diseases", all of which were published by Elsevier and sold by the thousands. He is on the editorial board of 43 journals in the field of rheumatology and autoimmunity and is the founder and the editor of the IMAJ (Israel Medical Association Journal) the representative journal of science and medicine in the English language in Israel, and also is the founder and Editor of the "Autoimmunity Reviews" (Elsevier) (Impact factor 7.9) and Co-Editor of "Journal of Autoimmunity" (Impact factor 8.1). He has organized over 20 international congresses in autoimmunity. Prof. Shoenfeld received the EULAR prize in 2005, in Vienna, Austria: "The infectious etiology of anti-phospholipid syndrome". He has received a gold medal from the Slovak Society of Physicians for his contribution to Israel – Slovakia collaboration (March 2006), and is honorary member of the Hungarian Association of Rheumatology. In UC Davis, USA, Dr. Shoenfeld received the Nelson's Prize for Humanity and Science for 2008. In 2009 he was honored as Doctoris Honoris Causa, from Debrecen University (Hungary), and from 2009 he is honorary member of the Slovenian National Academy of Sciences. He has recently been awarded a Life Contribution Prize in Internal Medicine in Israel, 2012 as well as the ACR Master Award in 2013. Prof. Shoenfeld has educated a long list of students (>25) being heads of departments and institutes.